The attorney of the firm is as a European Patent Attorney a registered representative before the European Patent Office (EPO). For proceedings before the EPO, the FICPI conduct rules (www.ficpi.org/ficpi/aboutframe.html) and the Code of Professional Conduct des epi (epi-Information 2/2001, S. 75) is applicable. 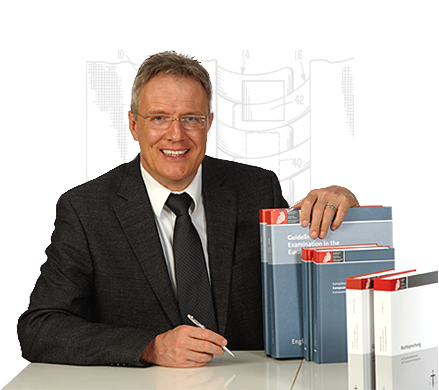 All contents of these pages are solely intended for the purpose of information on industrial property protection in Germany, Europe and worldwide. The pages have been carefully edited, however no guarantee is assumed for the accuracy of the offered contents. Also, no liability is assumed for the links to extrinsic pages, although also these have been very carefully checked, before they have been included. Should a link include criminal or nuisance provoking contents or refer directly to a page containing such contents, we kindly request to provide an according message to SK-Patent. SK-Patent will then delete this link. All contens including the images and texts are subject to the copyright of the attorney of SK-Patent. Any dissemination or professional use without explicit agreement is not allowed.